Inspired by Day, Artosis, & iNcontroL, I will be starting a live-streaming series where I will be deeply analyzing player-submitted replays, specifically geared towards new and lower level players! Tune in to learn some Starcraft and feel free to ask any and all questions you might have. The event will be described as follows.. The series schedule will be tentatively as follows and will be aired at www.twitch.tv/jaeyun. You are still free to submit replays even if you cannot make my stream due to time zone differences. The VODs will be available on my Twitch channel after each episode. 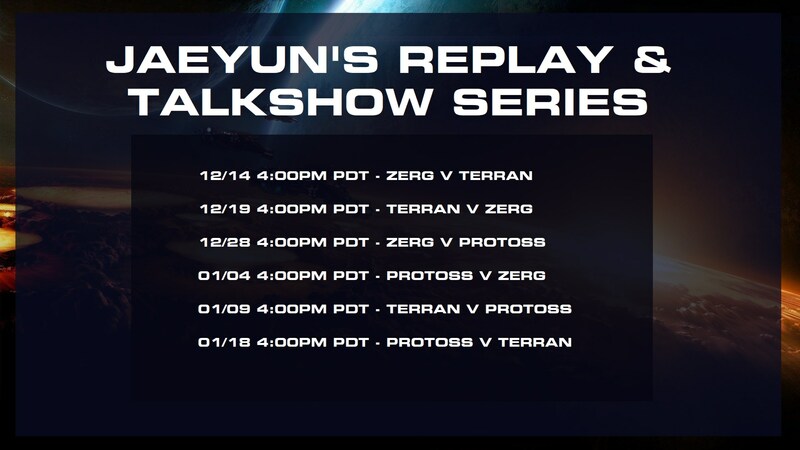 Submit your replay by uploading the file in 'Replay Submissions' section with a comment in the following format: "In Game User ID, MMR, Race, Question(s)"
Example: Jaeyun[Media], 1500, Zerg, How can I get my 4th base out with this build? Can you provide insight on how to better execute and optimize this timing push at 7:30? Support is by no means necessary, but greatly appreciated! I don't know if this kind of content will be helpful for anyone, so I will re-evaluate whether or not I want to continue at the close of the sixth episode. If there's support and demand, I can think of new ways to structure these episodes, ranging from bringing on more prominent guests to talk SC:R at large, going over top ASL/KSL pro games, and much more. See ya'll soon! This will be the official thread outlining any and all updates to this event. Thank you. I can listen what you say but I can't understand what you say. Can you write some texts for me and people like me? Looks interesting, thanks! I probably can't make it live but I'll check out the VODs. OMG! Great initiative Jaeyun !!!! who are you and how are you qualified? Near S-tier Zerg, top Zerg in NA, one of the biggest SC streamers, very involved with NA vs EU and showmatches of top tier foreigners. Thank you very much for starting this Jaeyun! Great idea! You plan on uploading the vods to youtube? in case u do i am interested in making translations to spanish so the latin community can benefit from your series too. I like Jaeyun’s casts a lot and I think he has a bright future ahead of him with future events. That sounds amazing! I might need some time to get that all set up but will keep you in the loop. Thank you for offering. To anyone else wondering who I am, that's definitely a fair question. I'm not a top player by any means and if you're looking for the best foreigner streamers to model your game off of - I would recommend watching players like Dewalt, Eonzerg, Dandy, Terror, Bonyth, etc. They are all excellent and stream quite regularly. The purpose of this event/series is to provide a gateway for newer players to have their games analyzed directly by an experienced player and to provide an outlet for asking any and all questions they may otherwise be afraid of asking to someone else. I wish Jaeyun would just do talk shows where he talked a specific strategy^^. Cool. It would also be nice to just have a scr talkshow that discusses recent events. Pylon show is a sc2 show where Artosis gets 15 minutes to talk about his favorite game. We could use something like it for starcraft1. Thanks all, and for the suggestions. This event can definitely go in many different directions - it really comes down to what works best and what the people want! My eventual hope is to pivot this series into something more like a talkshow like Rodya mentioned, but until I figure out what content works best for my audience, I'm going to keep it predominantly educational content. Definitely feel free to ask questions during the stream or during the Q&A session if you want an in-depth discussion about a strategy! Nyoken is confirmed to guest star on the TvZ and TvP series! Looking forward to watching this, man! Exactly the kind of thing I wish I had enough ambition/ability to do.